When camp cooking, it seems that we are always looking forward to our next meal and often disappointed with it. Freeze-dried, vacuum-packed, dehydrated, and processed until it is barely recognizable, some camping food causes us to yearn for the end of the trip and access to a fast food restaurant. It really doesn't have to be that way since campfire cooking meals can be terrific! Having a dutch oven in camp is like bringing your kitchen stove along. You can create virtually any food at camp that you could make at home. Dutch ovens have been around as long as the United States and have been used across our country by explorers, pioneers, and mountain men. Using dutch ovens while camping helps to keep alive the spirit of those early adventurers and their can-do way of living. Besides, making food in a dutch oven is not difficult and adds fun and excitement to a day of camping. The dutch oven is a simple, yet invaluable, tool for campfire cooking. It is a heavy, flat bottomed kettle with a lid, legs, and a bail wire to lift and hang. It was designed to cook complete one-pot meals on an open fire - perfect for camping! You can stew, bake, roast, or fry food by controlling the dutch oven temperature. 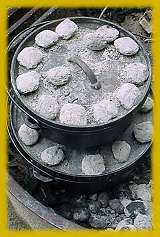 See selecting a dutch oven for details about choosing a good dutch oven for your camp cooking needs. The dutch oven migrated west as settlers expanded the country from the east coast. You'll see these ovens in use in any old western movie, often hanging over a campfire from a tripod. Famous explorers, such as Lewis & Clark, took the extra effort of transporting these heavy hunks of metal with them because they were so necessary in creating savory meals. Dutch oven recipes range from breakfasts to full dinners to hot and tasty desserts. Since dutch ovens are made of thick cast metal, they absorb heat, retain it, and distribute it evenly over the inside surface. This means even cooking and less chance of burned food. You probably won't be taking a dutch oven on a backpacking trip, but you and your crew will be very happy with the cooking on your next camping trip if you make room for your portable kitchen stove. The dutch oven is the ultimate camp cooking utensil - all you need is a campfire! If you haven't used a dutch oven before, then you probably won't believe that they are a fun way to cook camp food. But, I'm telling you the truth when I say it is fun to cook with dutch ovens. The food is clean, hot, and flavorful. There's no burnt spots and raw sections. There's no ash to brush off or sooty taste. Best of all, you prepare the food and then let it cook itself - much less monitoring than most campfire cooking requires so you are able to enjoy time at camp with everyone else. To improve your cooking and the enjoyment you get from using a dutch oven, you need to start with the right oven choice. Read on to discover how to choose the right dutch oven and to enter the great iron vs. aluminum debate. Will soon be teaching a Dutch Oven Cooking class at the University of Scouting, Aloha Council, Boy Scouts of America. Your website was a great help. Mahalo nui loa. Lord bless you and your family! @Sandra - You can use any size dutch oven to make biscuits. Just make a single layer of biscuits. 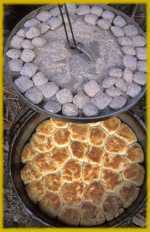 Use multiple dutch ovens to make more biscuits. Purchasing a Lodge dutch oven is a safe bet. 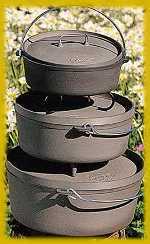 See this page for advice on purchasing a new dutch oven.